Perfect location, less than 3 minutes to the beach and 5 minutes to the centre of Cannes. Ideal for holidays and a good apartment for the congress. In the living room you have a double bed as a cabinet bed and a sofa bed. The double bed can sleep two adult and the sofa bed two adults or two children. The kitchen is well equipped and you also have a washing machine in the bathroom. You have a dining table in the living room, for four people, but most of the guests choose to have breakfast and lunch on the balcony where you have sea view and a view to Le Suquet, the old town of Cannes. If you arrive by car, you have free parking in a private street next to the building. The same street takes you down to the beach. 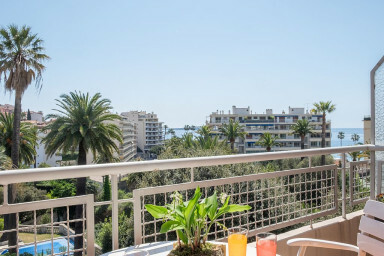 The apartment is located just off the Plages du Midi, just a few minutes walk from Le Suquet (the Old Town of Cannes), the Palais des Festivals, Croisette, the beaches and all else that Cannes has to offer. A short 3-minute walk takes you to Plage du Midi where you will find both a well-managed public beach and beaches belonging to the many beach restaurants where you can rent a parasol, a mattress, etc. Trevlig appartament med närhet till strandpromenad, härliga bad, prisvänlig livshandel och le Suquet. Rymlig terras med utsikt mot soluppgång över havet och Cannes fästning. Välplanerad, välrenoverade kök och badrum. Golvvärme gjorde vår vistelse under Bonne Annee 2018/2019 extra mysig. Stort tack!.